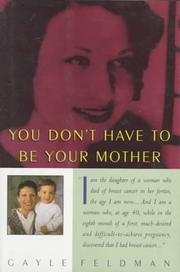  The moving memoir of a woman who discovered she had breast cancer when she was eight months pregnant--and the same age as her mother was when she died of breast cancer in her 40s. In a period of less than three weeks, Feldman (an editor at Publishers Weekly) had her baby's birth induced and her breast removed. The baby was healthy and the operation successful. A year later, she had her second breast removed as a prophylactic measure- -to ward off the 50%-60% chance that the cancer would reoccur. Those are the unadorned facts. But this is a tale of quiet courage, told by a woman who, as a teenager, had watched her mother slowly die because her cancer had been misdiagnosed until it was too late. Although Feldman also had seen a sister-in-law and a friend die of breast cancer, she had friends who had survived, strong support from her husband's family in England and from her own in Philadelphia, and an extraordinary husband. There was also plenty of money, good health coverage, and help at home for the baby. She had the luck--or the good judgment or the savvy or the drive--to find talented and compassionate doctors, including obstetrician, surgeons, and oncologist. That most of them were women for this most female of experiences may not be a coincidence. But this is also a diary of fear, loss, anger, confusion, and frustration. In an effort to still the anxiety of repeating her mother's experience, she explores her mother's stoical last years and wonders why mystery surrounded the operations and hospital sojourns. ``Talking wasn't done in those days,'' explains an older woman who had survived. Feldman makes up for that generation's silence by talking with simple honesty, without self-pity, about her three weeks in hell.